Our gîte 'groupe' located in the 19th century barn offers room for up to 12 people. The gîte contains many authentic details such as stone walls, beautiful massive oak beams and hardwood floors. On the main floor you will find large living/dining room, a fully equipped kitchen (gas stove/oven, dishwasher, microwave, refrigerator, etc.) and a WC. Outside there is a large terrace with an amazing view on the Cantal Mountains where one can easily recognise the highest point of the Puy Mary. Upstairs there are 5 bedrooms, each with its own en-suite shower/WC. 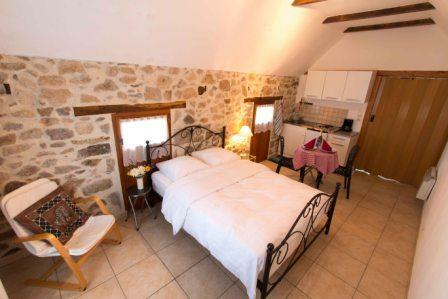 Located in the main house at Bétaillole is a lovely 2-bedroom gîte with room for up to 5 guests. This apartment, which has its own entrance, has been beautifully renovated and offers many of the traditional details which are so common for this part of France; stone walls, massive oak beams, hardwood floors and a Cantou, a traditional fireplace typical of the Corrèze. On the ground floor you will find a spacious kitchen, dining/living room, a large bathroom and a WC. Upstairs there are two large bedrooms with plenty of storage space. 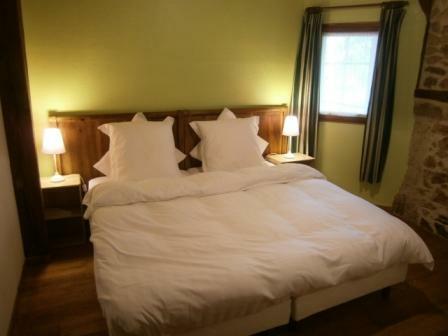 One room offers a double bed and the other three single beds. The spacious bathroom is equipped with a shower and next to the bathroom is a separate toilet/WC. 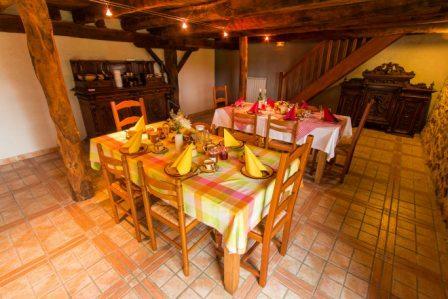 In the tastefully renovated 18th century barn there is a spacious 2-bedroom gîte with room for 5 guests. The apartment offers many authentic details such as stone walls, beautiful massive oak beams and hardwood floors. In the open kitchen you will find all the modern conveniences of home: electric stove/oven, refrigerator, dishwasher, coffee machine, water cooker, microwave and naturally dishes, cooking utensils, silverware, etc. In the master bedroom there is a 2-person bed and in the other bedroom there are three 1-person beds. Both rooms have a wardrobe to store your clothes. The spacious bathroom has a shower with shower curtain. Next to the bathroom is a separate toilet/WC. La Porcherie is a 2-person studio apartment which is located in a free-standing building which used to house the pigs. Although it sounds much better in French, La Porcherie translates to English as "pigsty"or "pigpen". It is equipped with a convenient kitchenette and a large bathroom. The patio in front of the Porcherie offers a breathtaking view of Betaillole and the majestic Cantal mountains. It is perhaps the best spot to sit and relax while reading a book or simply enjoying the tranquility.